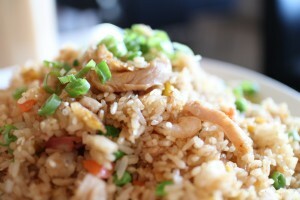 Here are some fried rice recipes to include on your carenderia or restaurant menu list. I’m sure your customers will love these fried rice recipes like the vegetarian fried rice, spicy fried rice, seafood fried rice, BBQ pork fried rice, chicken fried rice, and mushroom fried rice among others. 1. Heat the olive oil and sesame oil on non-stick pan. Fry the garlic and red onion until fragrant. Stir until the garlic and red onion are golden brown. And then add the red chilli. 2. Add the pork. Stir until pork changing the color. And then add horseradish and scallion. 3. Add the rice, and then barbeque sauce, black soy sauce, salt and pepper. Stir until mixed all. 1. Make sure that all of the ingredients are in small bowls right by the wok/large frying pan. 2. Add about 4 Tablespoon peanut oil to the wok and turn the flame on high heat. 3. When the oil is almost smoking, add the chicken strips and push around vigorously with a wok spoon or spatula. 4. When the chicken seems as if it is starting to brown, push it up the side of the wok and crack the eggs into the wok. 5. Stir the eggs around a bit. When almost fully scrambled, mix in the chicken and stir around for 30 seconds more. 6.Push the eggs/chicken to the side, add some more oil, and throw in the tomato and onion. Stir-fry for about 5 minutes. They will not look done, but in the end, they will be fine. 7. Add the cold cooked rice and mix it all in. 8. Turn the heat to low and then throw a few splashes of nam pla and soy sauce on to taste. 9. Put about a tablespoon of sugar (or more if wanted), a teaspoon of salt (the same applies), a teaspoon of MSG if wanted, a splash of vinegar, and two tablespoons of chili sauce if wanted. Lastly, put the garlic on top as well. 10. Stir it all in and turn off the heat. 11. On a large platter, arrange the garnishes on a lettuce leaf, and plate the fried rice next to it. 12. Invite whoever is dining to eat the garnishes with the fried rice. 1. Melt the butter on the non-stick pan. Fry the garlic, chilli and scallion, stir for 15 seconds. 2. Add the chicken and carrot. Cook until the chicken changes color (from pink to white). 3. Add the rice, and then the oyster sauce, Worcestershire sauce, salt and pepper. Continue to cook until combined well. 4. Serve hot with the dressing. 1. Before cooking fried rice, cook first the crab with 5 tbsp. oil and stir it in 1 minutes. Place it into a blank bowl, and make a fried rice. 2. Heat again the remaining oil, fry the garlic, red onion, scallion and the red chillies. Stir in 1 minutes until fragrant. 3. Add the fried crab and bean sprouts. Stir until the crab is changing the color. 4. Add the rice, and then fish sauce, salt and black pepper. Stir until mixed. 1. Heat the oil and sesame oil on non-stick pan, fry the garlic and scallion until fragrant. Add sukiyaki beef and chicken, stir at 1 minutes until golden brown. 2. Add bean sprouts, basmati rice, chilli powder and curry powder. And then add soy sauce, salt and pepper. Stir until mixed all. 1. Heat the canola oil on non-stick pan. When the oil is very hot, fry the garlic, red onion, ginger and red chillies. Stir at 20 seconds until fragrant. 2. Add the hamburger meat, cook until the hamburger meat changing the color. And then add the celery and scallion. 3. Add the rice, finally salt, black pepper and black soy sauce. Cook until mixed all. 1. Heat the oil on the non-stick pan, fry the garlic and big onion until fragrant. 2. Add the prawn and minced chicken fillet. Stir until the prawn and the chicken is changing the color. 3. Add the button mushroom, enoki mushroom and shitake mushroom. Now add the rice together with oyster sauce, chicken powder, salt and hoisin sauce. 4. Serves hot with garnishing. 1. Heat the oil on non-stick pan, fry garlic, red onion and red chilli, stir at 2 minutes. 2. Add the egg, and then add the rice, bok choy and pineapple meat. Now add some pepper and salt. 3. Serve hot in pineapple plate. 1. Heat the oil in non-stick pan, stir-fry the garlic, chilli and spring onion, cook at 1 minute until looks fragrant. Add the salted fish and chicken, stir until the chicken and salted fish are changing color. 2. Add the rice and bean sprouts, and then add the salt, pepper, and fish sauce. Serve with dressing. 1. Heat the oil in the non-stick pan, fry the garlic at 20 seconds until fragrant. Add the bacon, prawn, fishball and chicken. Stir-fry until changing the color. 2. Now, add the rice, and then add bean sprouts and spring onion. Add a salt, pepper, jalapeño and soy sauce. Serve with the dressing. 1. Heat the oil on non-stick pan, fry the big onion, garlic, red chilli, ginger and scallion. Stir at 30 minutes until it’s fragrant. Now add the basmati rice. 2. Add the chilli powder, light soy sauce, fish sauce, chicken powder, salt and pepper. Cook until all mixed. Served hot. 1. Heat the oil on a non-stick pan, fry the big onion and garlic, and stir at 25 seconds. Stir until fragrant. 2. Add the rice, and then add all the vegetables, finally add some salt, light soy sauce, oyster sauce and pepper. Stir until mixed all. 3. Serve for 5 plates. 1. Heat the oil on non-stick pan, fry the garlic until golden brown. Put the bacon, prawn and char siu, cook slightly at 5 minutes. 2. Add the scallion, peas and egg, cook until all cooked, and then add the rice, finally add the salt, pepper and jalapeno.